Designed for Military, Rescue Team, and Individual use! of the product user to get proper medical training prior to use. First aid products can also be dangerous if they are used by improperly trained individuals or if the products are used incorrectly. Be smart, get some first aid training! 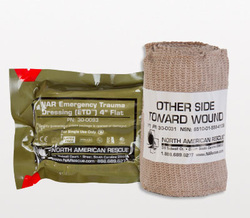 After Action Reviews from today’s battlefield identifies the need for a larger sized occlusive dressing to treat multiple penetrating chest injuries due to blasts from improvised explosive devices and multiple fragment peppering wounds. 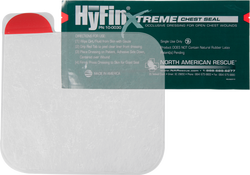 North American Rescue® has responded to our customer’s needs with the development of the new HyFin® Xtreme Chest Seal, which measures H 8 in. x W 9.25 in. and covers more than twice the surface area of other chest seals. With an enhanced adhesive gel formulation, the new HyFin® Xtreme Chest Seal creates a superior seal. It also features a transparent backing to allow placement directly over the wounds of the casualty and can be written on for treatment documentation if necessary. It easily conforms to the casualty’s chest and maintains its aggressive adhesive capability, even under adverse conditions. The HyFin® Xtreme is designed with a large, easily-visible red elliptical tab for single step peel-and-apply application that can also facilitate the burping of a wound if necessary. To ensure high quality performance, NAR packages each chest seal using its’ signature Red Tip Technology® red tear notches in a rugged, easy-to-open, foil pouch. The HyFin® is Made in America and is 100% latex free. the best minds in the field were applied to the best available data. The result? Our patented design improves the probability of success when managing casualties who present with signs and symptoms of a tension pneumothorax. cap from the needle system to allow immediate confirmation of placement. Strong, reliable needle/catheter: 14 gauge x 3.25 in. *The use of this product should employed by properly certified individuals. ** Purchase of a (decompression needle) medical device requires that users have the supervision of a medical practitioner. Devices requiring such supervision may be labeled "Caution" or "RX only". Ensuring this supervision is your responsibility. more than just a necessity: It could mean the difference between life and death. Severe injuries in such inaccessible areas creates the need for trauma care which can be administered quickly, easily and effectively. TK-4 (Tourni-Kwik 4) is the one-handed tourniquet made to stop arterial bleeding quickly and efficiently from combat or accidental amputations. injuries. It is developed and engineered specifically for combat self-help: Full one-handed application, quick and direct. Even for the First Responder or Law Enforcement personnel on a mass casualty scene, it allows fast, sure treatment of the injured until help arrives. traumatic wound with significant hemorrhage. adequately tightened, bleeding will cease and the windlass is locked into place. 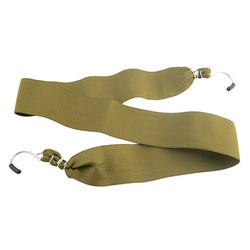 A hook and loop windlass retention strap is then applied, securing the windlass to maintain pressure during casualty evacuation. The C-A-T®’s unique dual securing system avoids the use of screws and clips which can become difficult to operate under survival stress or where fine motor skills are compromised. The patented Combat Application Tourniquet® (C-A-T®) featuring the proprietary red tip design and the mechanical advantage of a band within a band has been the Official Tourniquet of the U.S. Army since 2005. The innovations in the C-A-T® are protected by U.S. Patent Nos. 7,842,067 and 7,892,253. The C-A-T® Holder was specifically designed to allow personnel to place their C-A-T® Tourniquet on their vest or gear for rapid and easy access. It is made of 500D IR Signature Reduced Nylon with MOLLE/PALS-style connectors. 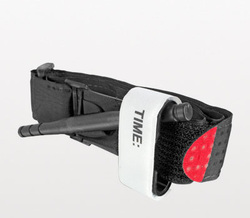 The C-A-T® Holder protects your tourniquet from the elements and has an easy-open pull tab with Velcro® enclosure. The C-A-T® Holder is available in Black, Coyote, and Multicam, and OD Green colors. from severe trauma. 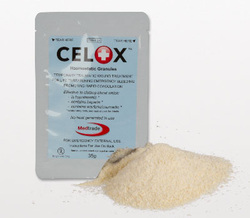 The original version of CELOX is composed of hemostatic granules that can be easily poured directly into a wound. The granular presentation is the most versatile of the CELOX™ products providing a simple, quick way to control bleeding and is particularly useful in treating difficult and deep wounds. Celox is a must have in any first aid kit. process in the most demanding conditions. The ETD™ can also be used to sling and swath an arm, to secure splints to an extremity or to perform in any other function requiring an elastic wrap.